Tetsuya Komuro (born November 27, 1958 in Fuchu, Tokyo) Keyboard, composition, arrangement, lyrics, producer, chorus. Takashi Utsunomiya (born October 25, 1957) Main vocals, chorus. He is acting solo singer. And also, as an actor, performed in the musical “Rent” in Japan. Naoto Kine (born September 26, 1957) Guitar, composition, piano, harmonica, chorus. He is acting solo singer-songwriter. And also, as an author, written many novels and other books. TM NETWORK is a Japanese Pop/Rock band. 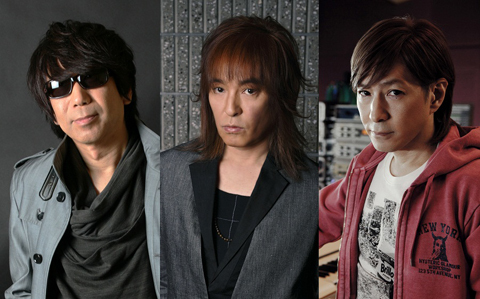 Consisted of Tetsuya Komuro (Keyboardist), Takashi Utsunomiya (Vocalist) and Naoto Kine (Guitarist). They were original members of a band call Speedway during their school days. The three of them formed TM NETWORK. Their name is commonly thought to stand for “Time Machine Network”. However, on September 6th 2006 on an episode of Trivia no Izumi claimed that TM actually stands for ‘Tama’, the district from Tokyo they all came from. While Trivia no Izumi claims that TM stands for ‘Tama’ Tetsuya Komuro himself as early as 1984 on the show LiveG, has said that the TM stands for Time Machine. On August 22, 1983 TM NETWORK took part in “the Fresh Sounds Contest” which was sponsored by Coca-Cola. The song they performed was “1974” and it was aired on TBS. This was their first step towards a record deal. They made their record debut with single “Kinyoubi no lion (Friday’s Lion)” and album “RAINBOW RAINBOW” on April 21, 1984.